he deduced that Earth’s early atmosphere consisted mainly of hydrogen, ammonia, methane, and water and that these would react with one another when lightning passed through them. His graduate student, Stanley Miller, performed the famous Miller-Urey experiment which demonstrated that when electric sparks pass through a mixture of these simple gases the products are amino acids – the building blocks of life. Harold Clayton Urey was born on April 29, 1893 in the small town of Walkerton, Indiana, USA. His father, Samuel Clayton Urey, was a small-scale farmer, schoolteacher, and lay preacher in the Church of the Brethren – a somewhat austere, pacifist Christian denomination. His mother, Cora Rebecca Reinoehl, was a housewife and farmer. Like Harold’s father she had a college degree. She worked as a school teacher before giving birth to Harold and his younger brother and sister. When Harold was six years old, in October 1899, his father died, plunging the family into poverty. Cora and her three children lived with Samuel’s mother in her farmhouse in Corunna, Indiana. Harold attended a single-room country school, where he received a limited education. When he was 11, his grandmother died. His mother moved her children deeper into rural Indiana where they grew onions to sell. Harold attended high school in Kendallville, Indiana. He was able to do this only because his father had left money from his life insurance policy to be used exclusively for his children’s education. Harold prospered at high school, learning some biology and physics (but no chemistry) and joining the school’s debating team. He was top in all of his classes and his nickname was Professor. Urey graduated from high school in 1911, aged 18, and attended Earlham College in Richmond, Indiana, where he received a teaching certificate. He then did some teaching in Indiana’s small country schools before enrolling at the University of Montana in 1914, aged 21. Three years later, he received a B.S. degree with a major in Zoology and a second major in Chemistry. By this time America had joined the western allies in World War 1 and Urey’s chemistry skills were highly sought after. He began working for Barrett Chemical Company, an explosives manufacturer in Philadelphia, Pennsylvania. His work convinced him his future lay in chemistry or perhaps biological chemistry. In 1919 Urey returned to the University of Montana as a chemistry instructor. He worked in this role for two years, then moved to the University of California, Berkeley, in August 1921. There it took him just two years to earn his Ph.D. in the laboratories of the great physical chemist Gilbert N. Lewis, famous for his work in the field of chemical bonding. Lewis was also well-known for the almost total freedom he gave his graduate students. At Berkeley, Urey became increasingly fascinated by the newly emergent field of quantum chemistry. In August 1923, aged 30, Urey traveled to Denmark to spend a year carrying out postdoctoral research at Niels Bohr‘s Institute of Theoretical Physics in Copenhagen. In the previous year Bohr had been awarded the Nobel Prize in Physics for his discovery that electron energy levels in atoms are not continuous – they come in steps. The atom is said to be quantized and can be explored mathematically using quantum mechanics. Bohr had also shown that an atom’s outermost electrons – its valence electrons – are of overwhelming importance in determining its chemical properties. In doing so Bohr invented quantum chemistry – a highly mathematical field – and Urey wanted a piece of this action. In an enormously enjoyable year in Copenhagen Urey learned a lot, including the fact that, although his ability in mathematics was very high, it was not as high as Bohr’s or some of Bohr’s best theoretical physicists. Urey decided his opportunities to get to the front of the scientific pack would be found in experimental rather than theoretical chemistry. Returning to the USA in 1924, Urey became a research associate at John Hopkins University in Baltimore, Maryland, but he grew increasingly unhappy about the progress of his research there. In 1929, aged 36, he moved to Columbia University in New York City as an associate professor of chemistry. In 1913 J. J. Thomson had found that atoms could have different masses, even though they were atoms of the same element. Today we call such atoms isotopes. Isotopes exist because atoms of the same element can have different numbers of neutrons. This was not known until 1932, when James Chadwick discovered the neutron. In the year 1931 Urey already knew of the possibility that hydrogen could exist in a heavy form whose mass was double that of its usual form. He then read a paper suggesting that about one hydrogen in every 4,500 might be heavy. His calculations suggested its boiling point would be higher than normal hydrogen’s, which meant that the proportion of heavy hydrogen in a sample could be increased by removing normal hydrogen in a low temperature distillation. He asked Ferdinand Brickwedde of the United States Bureau of Standards to distil 4 liters of liquid hydrogen until just 1 ml remained unevaporated. In this small sample, Urey had calculated the proportion of heavy hydrogen would be 100-200 greater than normal. Using Bohr’s mathematical model of the hydrogen atom, Urey had also calculated how the spectrum of heavy hydrogen would differ from normal hydrogen. In the fall of 1931 Urey and his assistant, George Murphy, measured the spectrum of the 1 ml sample, finding exactly the spectral lines he had predicted for heavy hydrogen. The discovery was made on Thanksgiving Day, 1931. Urey named the new form of hydrogen deuterium. Deuterium is heavier than normal hydrogen. 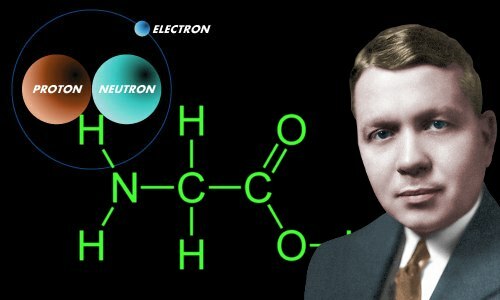 The neutron was discovered soon after Urey’s discovery of deuterium. The addition of a neutron explained the difference in mass between hydrogen and deuterium. Although he was the sole winner of the prize, in an act of generosity that was typical of him, he shared part of his prize money with the two others who had played important parts in the discovery – George Murphy and Ferdinand Brickwedde. For much of the 1930s Urey produced elements enriched in their minor isotopes. Such materials proved vital in the discovery of biochemical pathways. For example, if a rat ate some chow enriched with an isotope of carbon, the tissues and molecules the isotopically enriched carbon eventually appeared in gave precise information about where the molecules present in the food had ended up after it was eaten. In 1932 Urey founded the Journal of Chemical Physics and served as its editor between 1932 and 1940. When the United States took the decision to build an atomic bomb, one of the men clearly destined to take part was Harold Urey. To make a bomb, isotopes of uranium would need to be separated and nobody knew more about isotope separation than Urey. In May 1941 he was appointed to the important S-1 Executive Committee. By late 1943 he had over 700 people working for him on a project to separate uranium’s isotopes by gaseous diffusion. By early 1945 Urey had been driven to a state of nervous exhaustion by the work and a bad political atmosphere from people working both above and below him. He handed control of the project to Ray Crist. Urey was awarded the Medal for Merit for his work on the project. Before and during the war he also played a large part in helping Jewish scientists escape from areas of Europe that were under Nazi control. In 1945 Urey became Professor of Chemistry at the University of Chicago’s Institute for Nuclear Studies. In late 1946 he realized that natural process could produced isotope-enriched matter. Creatures such as shellfish, whose shells were formed from carbonates, tended to favor the oxygen-18 isotope over the more common oxygen-16 isotope in building their shells. Moreover, the ratio of these oxygen isotopes in the shell depended on the average temperature when the shell was made. By early 1949 Urey had built mass spectrometers sensitive enough to measure oxygen isotope ratios with great precision, which enabled him to discover average temperatures millions of years ago. For this work Urey received the Geological Society of America’s Arthur L. Day Medal, and the Geochemical Society’s Goldschmidt Medal. Urey’s paleoclimate work led him to think about the relative abundances of the chemical elements on our planet. He began thinking about the chemistry of the elements on other planets and in the stars. He coined the word cosmochemistry to describe this field and wrote a book The Planets: Their Origin and Development, published in 1952, which is widely regarded as the work that founded modern planetary science. He also began considering how life could have begun on Earth. In 1951 he read a paper proposing that suitable carbon compounds capable of giving birth to life in a ‘primordial soup’ could have been formed by high energy radiation. The paper reported an experiment in which bombardment with helium nuclei had caused carbon dioxide to react with water to produce formic acid. Urey thought this work was completely disconnected to how the molecules of life might actually have first been made. He discussed the issues at one of his Chicago research group’s seminars. 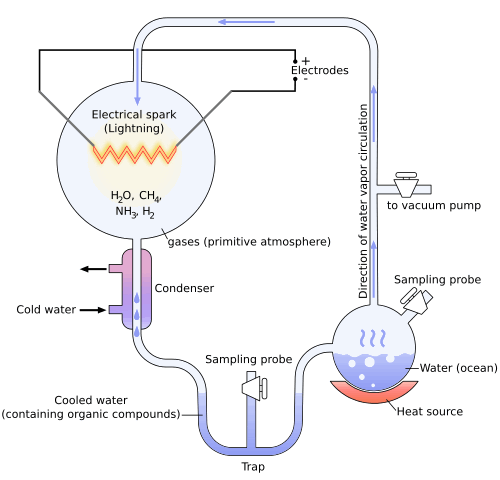 He stated his belief that the first molecules necessary to build living organisms were probably formed by lightning storms causing the gases in Earth’s early atmosphere – he proposed these were mainly hydrogen, ammonia, methane, and water – to react with one another. After the seminar a student by the name of Stanley Miller approached Urey and told him he would like to investigate Urey’s idea as the theme of his Ph.D. Urey was at first wary. He thought his idea might be a rather risky proposition for a Ph.D. thesis, but in the end agreed to the proposal. Within a few months Stanley Miller had carried out one of the most famous experiments ever conducted into the origin of life – the Miller-Urey experiment. The Miller-Urey Experiment. Image by Yassine Mrabet; licensed under Creative Commons. Miller passed electrical sparks through a mixture of hydrogen, ammonia, methane, and water vapor, and found that after a few days the chemical reactions had produced a sludge of amino acids. The importance of the experiment was the discovery that simple, inorganic chemicals could react under natural conditions to produce more complex organic molecules – amino acids – the building blocks of life. Urey was Miller’s doctoral advisor and by custom his name should have appeared on the published work. However, Urey was concerned that as a Nobel Prize winner, he would receive all the credit while Miller would receive very little. Therefore Urey insisted that only Miller’s name should appear on the work. Urey married Frieda Daum, a bacteriologist, in 1926 and they had four children: Gertrude Elisabeth, Frieda Rebecca, Mary Alice, and John Clayton. In 1956, at age 63, Urey left Chicago to spend a year in the UK as a visiting professor at the University of Oxford. At age 65 he retired from his position in Chicago, accepting a role as a professor at large at the University of California, San Diego, helping to build the science faculty there. He remained in this role until, in 1970, aged 77, he became a professor emeritus, remaining associated with the University of California, San Diego, until his death. Harold Urey died on January 5, 1981, aged 87, at La Jolla, California, and was taken back to Indiana where he was buried in the Fairfield Cemetery in DeKalb County. "Harold Urey." Famous Scientists. famousscientists.org. 10 Jan. 2016. Web.